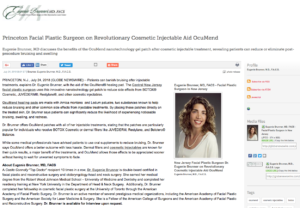 Princeton, NJ — Patients can banish bruising after injectable treatments, explains Dr. Eugenie Brunner, with the aid of the OcuMend® healing pad. The Central New Jersey facial plastic surgeon uses this innovative nanotechnology gel patch to reduce side effects from BOTOX® Cosmetic, JUVÉDERM®, Restylane®, and other cosmetic injectables. OcuMend healing pads are made with Arnica montana and Ledum palustre, two substances known to help reduce bruising and other common side effects from injectable treatments. By placing these patches directly on the treated skin, Dr. Brunner says patients can significantly reduce the likelihood of experiencing noticeable bruising, swelling, and redness. Dr. Brunner offers OcuMend patches with all of her injectable treatments, stating that the patches are particularly popular for individuals who receive BOTOX Cosmetic or dermal fillers like JUVÉDERM, Restylane, and Belotero® Balance. While some medical professionals have advised patients to use oral supplements to reduce bruising, Dr. Brunner says OcuMend offers a better outcome with less hassle. Dermal fillers and cosmetic injectables are known for their quick results, a major benefit of the treatments, and OcuMend allows those effects to be appreciated sooner without having to wait for unwanted symptoms to fade. A Castle Connolly “Top Doctor” recipient 10 times in a row, Dr. Eugenie Brunner is double-board certified in facial plastic and reconstructive surgery and otolaryngology-head and neck surgery. She earned her medical degree from the Robert Wood Johnson Medical School – University of Medicine and Dentistry and completed her residency training at New York University in the Department of Head & Neck Surgery. Additionally, Dr. Brunner completed her fellowship in cosmetic facial plastic surgery at the University of Toronto through the American Academy of Facial Plastic Surgery. Dr. Brunner is an active member of several prestigious medical organizations, including the American Academy of Facial Plastic Surgery and the American Society for Laser Medicine & Surgery. She is a Fellow of the American College of Surgeons and the American Academy of Facial Plastic and Reconstructive Surgery. Dr. Brunner is available for interview upon request.